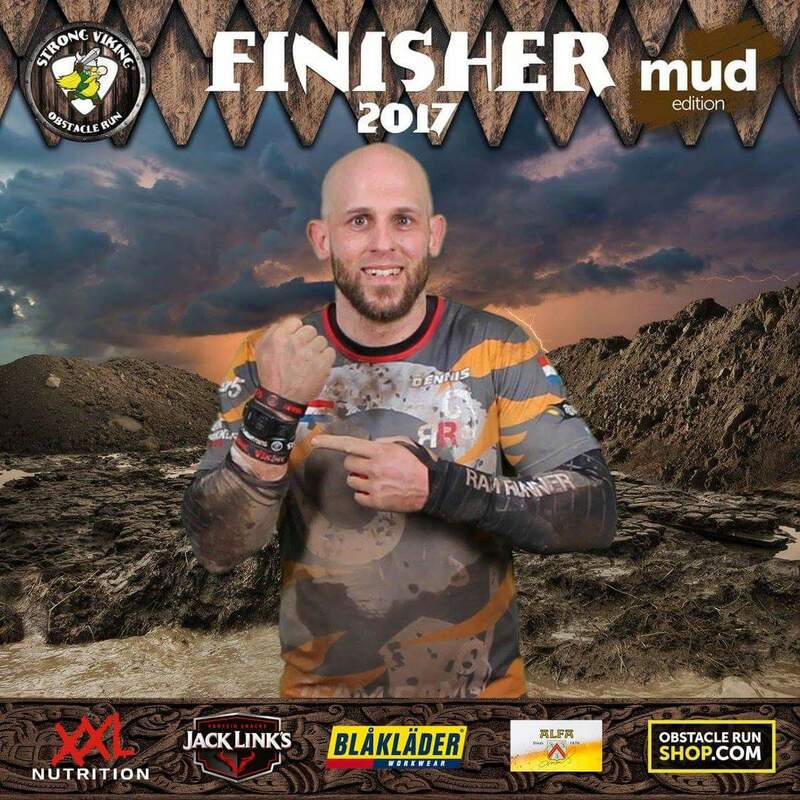 My first Strong Viking Run in 2017. I planned to do a total of 3 distances in one weekend, 19+7km on Saturday and another 19km on Sunday, even though I was still recovering from an elbow/wrist injury. Hey, if the bone doesn't punch through then there's no reason not to try right? The first 19km started early in the morning on Saturday. I wanted to join my teammates running the first 7km wave, which meant we had to finish before 12:20 pm. This gave us only 2:40 to run the course. We started out with other teammates, but since Ronald and myself were the only two aiming for that 7km wave, we decided to head out ahead of the rest. 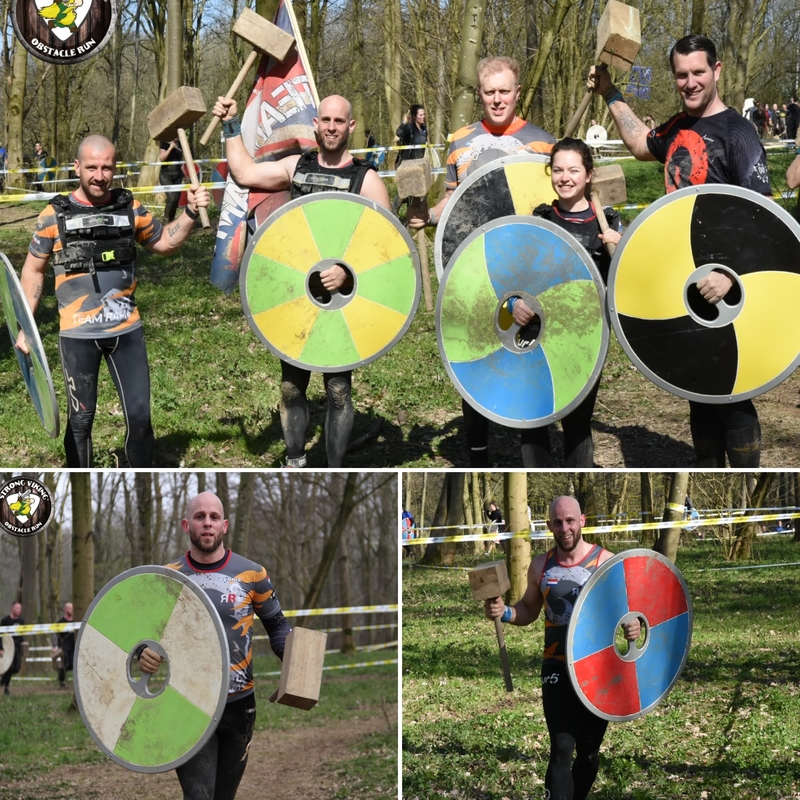 First few obstacles were easy, rope climb, some trenches, lots of hurdles action photo's at the shield carry and then off towards the new Hammer Banger. This time they placed the beam on top of a wooden structure. Nothing was holding it down so hitting it more than ten times meant the beam went out of balance, tilting off of it on the other side. Next came Storm the Castle. My 2016 nemesis. I had been struggling with that one for most of 2016. Managed to do it most of the time, but with a lot of effort. The addition of my elbow/wrist injury made me hesitate to do to it even more. I noticed we had to walk through mud RIGHT IN FRONT of the ramp! But also one dry spot to the far right. Some other racers were queuing up in front, so I moved past them on the far right and ran off towards the ramp. One foot did get wet, so stepping on the bottom part made it slide back, but I could still keep my balance and some of the speed. I launched myself towards the wooden beam and grabbed it with both hands. 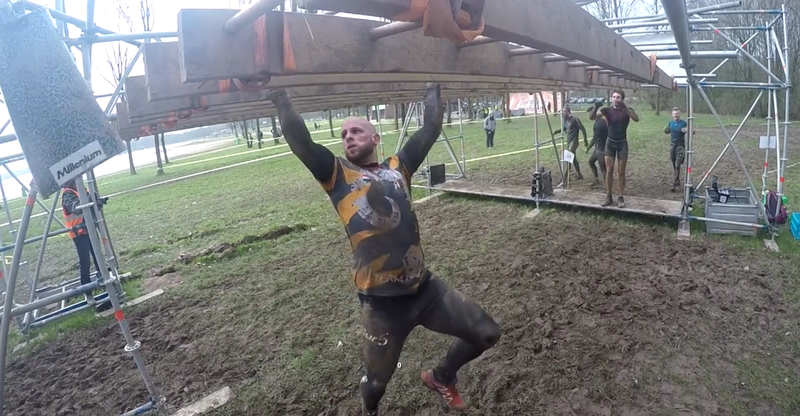 I had a good grip on the beam, so I could grab the metal bar above it! I was on! And the wrist and elbow were pain-free! Next came Raise the Sail, pulling a 32kg kettlebell up towards a beam and gently releasing it again. I'm not slim at all, but even with my mass, it was tough to get the kettlebell up. Back into the woods, past obstacles like the Viking Battle, climbing a Skeleton Frame, Balance Bars and then off towards the first series of trenches. DEEP and STEEP trenches. Since we where in the first wave the edges of the trenches didn't have much to climb on yet. We helped each other over and continued through the Mud Crawl. After a quick drink, we went towards the Monkeybars. 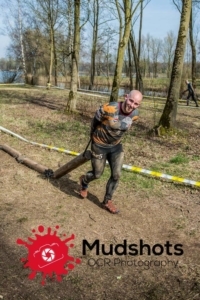 At that point, I still didn't experience any pain in my arm, so I decided just to give it a go. Skipping every other bar, swinging my way across. Almost missed the bell on the end, but finished it again without any pain! At Brother Hill, we saw a lot of people struggling to get on. We tried something different. We noticed it takes just three people to reach the net. Standing one on top of the other and then the third climbing over the first three. That third person can now pull up the second towards the net and with a little push from below the bottom person as well! Didn't take long for us to get up. We approached the finish of the 7km lap. Turned towards the Log Jump. Because of my injury, I wasn't able to do any upper body workouts for almost two months. The height of the logs combined with the lack of strength to lift myself up once my arms were on top of it, made it impossible to get over them without using the side beams. After a few kilometers, we ran into the Thor's Odyssey. Last year I twisted my ankle walking down with the sand bag, resulting in an injury lasting a couple of months. So I was a little anxious going up the hill. 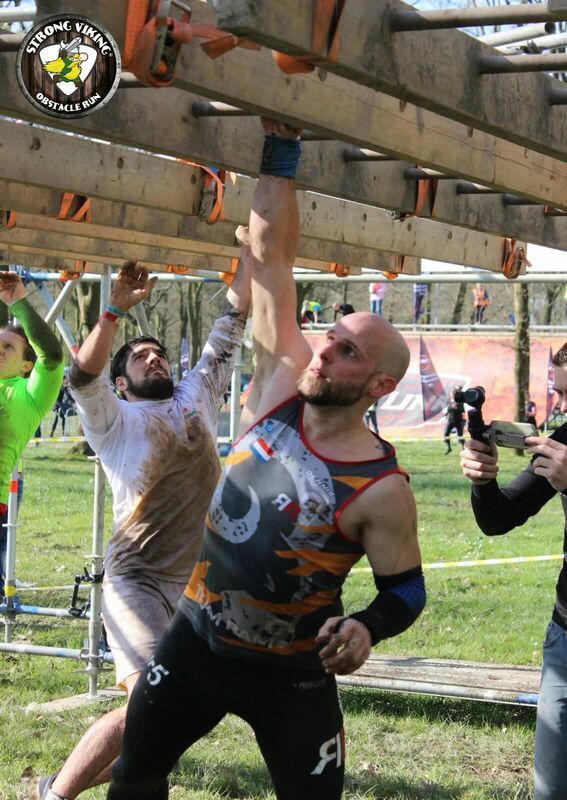 Reaching the Strong-Wall, I was greeted by fellow teammate Ewoud volunteering at that obstacle. Climbed over the wall and with the sandbag back down the hill. Carefully watching where I put my feet every step of the way. Another few kilometers in we ran into the new Gunnor's Struggle. They added beams to the vertical beams, giving it two steps up and two back down. So not just hopping forward, but up and down as well. Completely forgetting my elbow, I went ahead. Past a few hesitating runners. Up, and over. I wouldn't say like a breeze, but it was damn close! 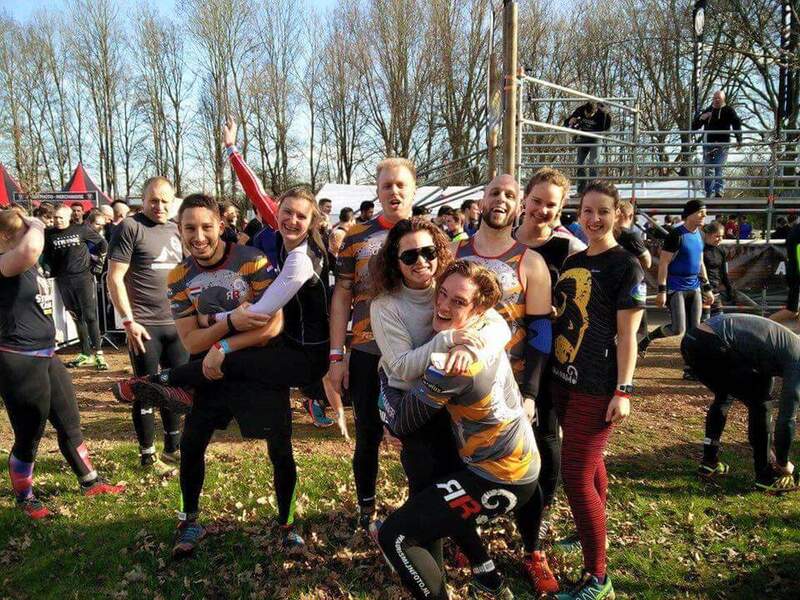 We continued making our way through a lot of mud, more weight carries, climbing over some hay stacks and running through a cow barn (the obstacle being the lovely smell of cow manure) we reached Conan's Wheel. Lifting a large tire hanging from a pivot and walking it in a circle back to the base was a nice addition! Next the walls. Ever since last year I've had no trouble with the walls at all. I didn't even need the step on the high wall. Next the Weaver a technical and very demanding obstacle. Since we were closing in on our cut-off time to be able to start with the 7km, we did our best to get across as fast as possible. Ronald was having a lot of cramps. I felt I started to cramp up every time I stopped running. I had to keep moving. We decided to split up, so I could try to get in on time and maybe stall the start of the 7km a bit. Back at the event terrain, I ran into the Platinum Rig. One of my favorites. It was the same as the previous editions, so I went through easily. Next, the new Varjagen, split into two pieces. First the inclining wall, dragonback, and wheels. All no problem at all. Next the pegboard and new snake rings. Pegboard already was tough as nails, but since I depleted all my already failing upper body strength already, I wasn't able to complete it. Wanted to try the snake rings, so monkeybar'ed my way towards them, but failed after the third ring. I quickly ran towards the final obstacle, the Walhalla Steps. Being “only” 5'9″ I always have trouble getting up the first step without using the side. Not this time. Launched myself up there. I make my way up I heard the countdown on the other side of the starting wall. That was the 12:20 wave! I was too late! I got over the steps as fast as I could, trying to spot the team flag among the people struggling to get over the first wall. But there they were! My buddy Mischa and the bright smile of Liekjh! A rush of adrenaline. 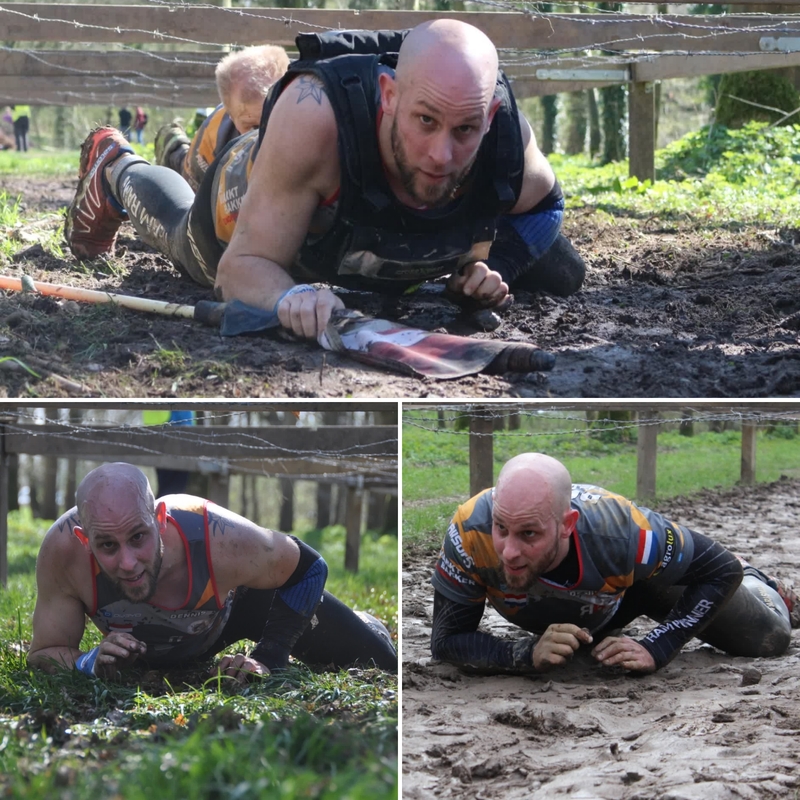 I had to grab my beast wristband, a finisher shirt, bottle of water, head to the CrossXvest stand, find my vest, hurry back towards the starting area, jump a fence and there I was! At that moment Ronald crossed the finish line and hopped in the starting area as well! Ready to start round 2! Round two was a support round for our friend and team member Liekjh. She's recovering from a knee injury. 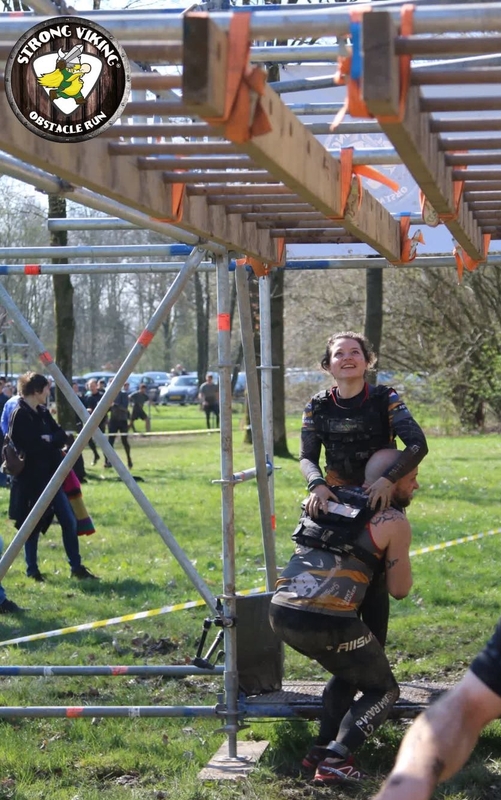 She was devastated about not being able to run and not being able to do what she loves doing, Obstacle Course Racing! 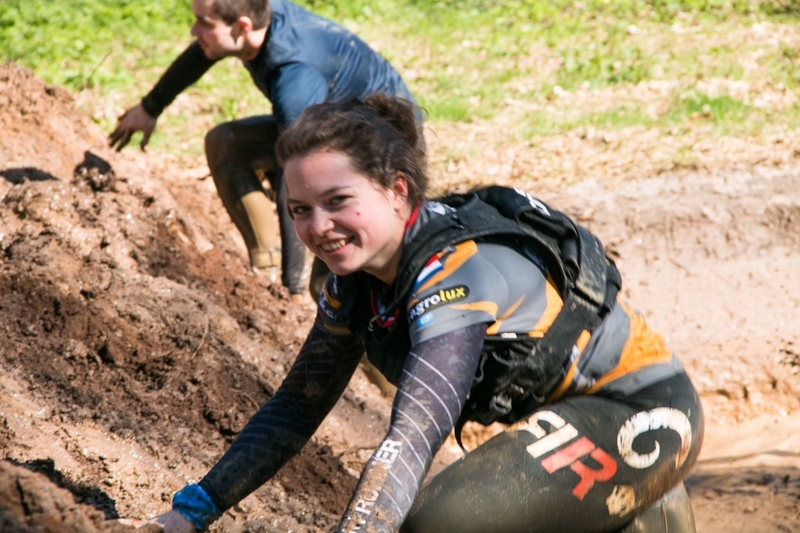 Luckily team member Mischa came to her rescue, offering her a 7km starting pass. Brave as she is, she decided to do it walking only. It wasn't easy for her to NOT run, knowing how not running is even harder than running with an injury. But the athlete in her, and us cramping up all over the place dragging her down kept her from increasing her pace. We laughed our way through the first kilometers. As I approached Storm the Castle, I realized I was 4kg heavier this time (wearing the CrossXvest). But I reached the top bar this time! Next, a lot more laughs, monkeying around, trying not to get cramps, utterly failing at that. And just enjoying ourselves. Reaching the mud trenches, we noticed the mud pools where significantly deeper than when we first went through. Cramping up at the thought of getting through them, me and Ronald decided to go around them. Rejoining our buddies at the mud crawl. At the Monkeybars we noticed the bars were a lot muddier as the previous round. I slipped on the third bar, trying to grab every other bar again. So I tried again, this time sideways. All of us made it across, and we were off towards Brother Hill. Lots of people were struggling here. Round two, so we tried the same tactic as before. Took us little to no time to get on top. Weight vests and all! Approaching the finish obstacle, Walhalla Steps, we helped each other get on and over. Must have been the slowest 7km for all of us, but we did the entire run with a smile (call it twitch with the cramp) on our faces! I started out with little to no pain from day one. Felt a little tired, but blame the daylight savings time shift that night on that mostly. 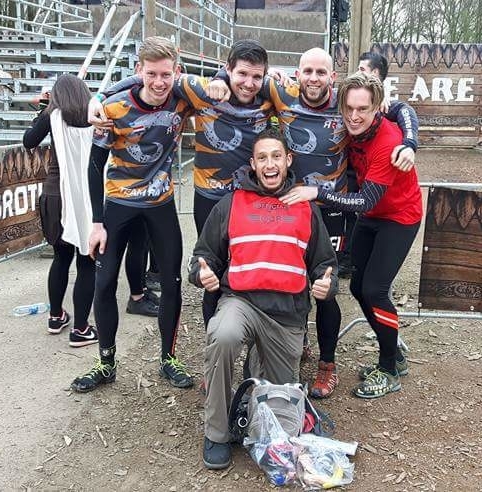 We started out with a few team members again, around 30 minutes behind the OCR Race Series. Rocketed over the starting wall and off we went. I noticed everything felt ok, as long as I kept moving! Standing still for too long made my calfs feel like they were going to explode. I ran the first few kilometers with Ewout and Björn. Steady pace, laughing our way through again. Björn also had a knee injury, forcing him to slow down. The 26km from day one started to take its toll. I had to keep moving. Ewout decided to stay with Björn, and I went ahead. Flew over Storm the Castle regained all my confidence on that obstacle. Managed to almost overshoot the top bar. Had a hard time at Raise the Sails. The 32kg kettlebell felt twice as heavy but got it to the bar in the end. Ran on and was able to keep my pace up. Entered the trenches, decided to get through them this time and made my way through easily. Caught up with teammate Kevin marshaling the race series and got recognized for running past a drinking post for the third time that weekend. Next the Monkeybars. Feeling confident about the elbow I managed to do it sideways skipping every other bar. Off towards Brother Hill. 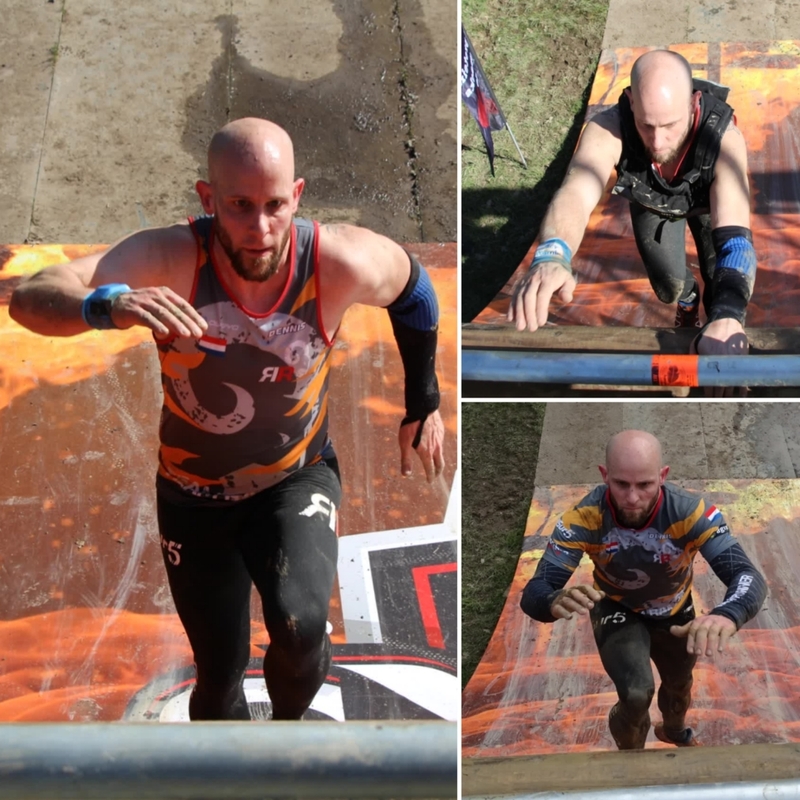 One of the ropes of the race series was still hanging off of the ramp, so since I was running alone, I grabbed it and quickly got up and over. 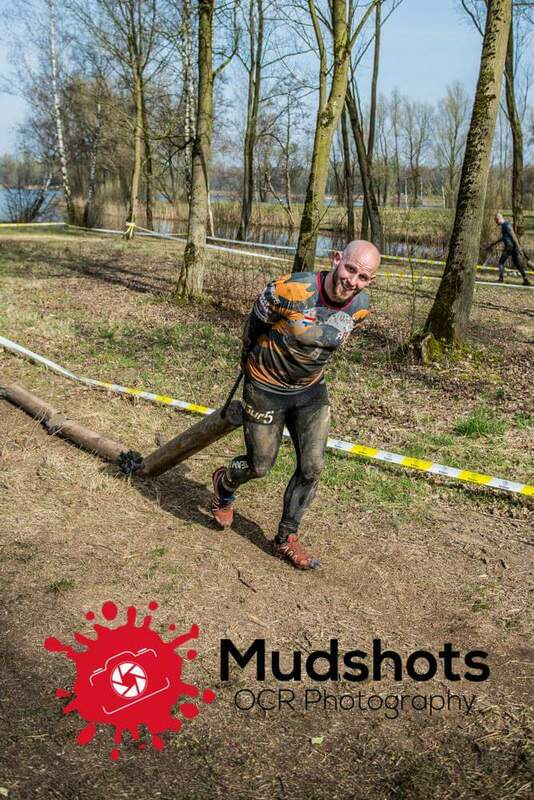 The Log Jump turned out to be easy since they placed a horizontal log at the bottom to aid the race series. Got over easily this time. Launched a hammer at Throw the Hammer, missed, launched a second and hit the target dead on. Had a laugh with the marshals and moved on. 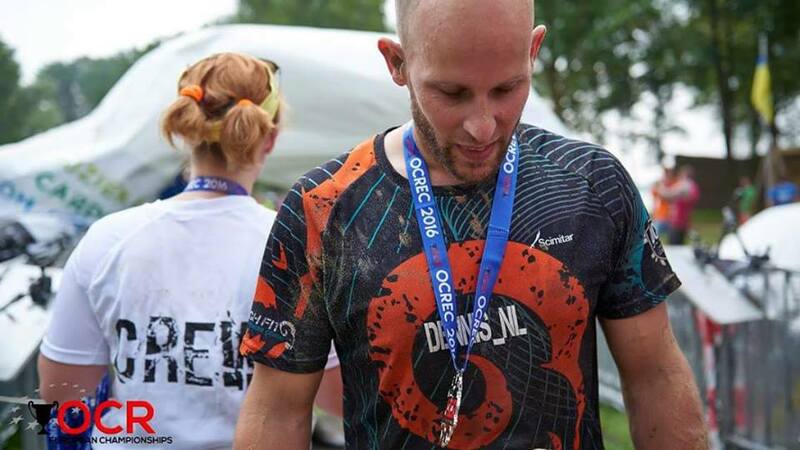 At that point, I ran into teammate Daan and MIT Charlotte telling me I was only minutes behind the race series sweeper. Motivated by the thought of overtaking the sweeper I picked up speed. 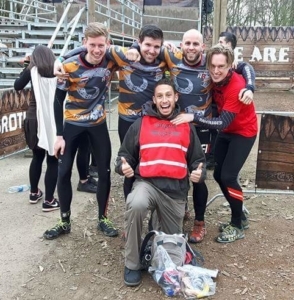 Quickly dealt with the Rope Climb XL and into the forest surrounding Thor's Odyssey. That's where I saw the sweeper. Since he needed to keep a steady maximum pace, I overtook him and moved on to the sandbags. Moving uphill with the sandbag was heavy, but still didn't feel impossible. Up top at the Strong-Wall teammate Mischa motivating me to keep going. I Hurdled myself over the wall and backed down with the bag. Again minding every step to not twist my ankle like last year. I started overtaking people running the race series. Caught up with a few of them at the new Gunnor's Struggle. “Struggling” to get through. Feeling confident I grabbed the stick, got up on the beams and hopped across. At that point, my pace slowed down a bit, but I was still going steady. Could keep the cramps down to a minimum and just keep going. Almost ran around Conan's Wheel, passed more series runners on the walls and cussed myself over the Weaver, receiving a hug from teammate Sharon once I was over. Final stretch. Through the last part of the course back to the event site. Running up towards the Platinum Rig. Teammate Wesley and MIT Nicole cheering me on. Running up towards the first part of the Varjagen Saga. 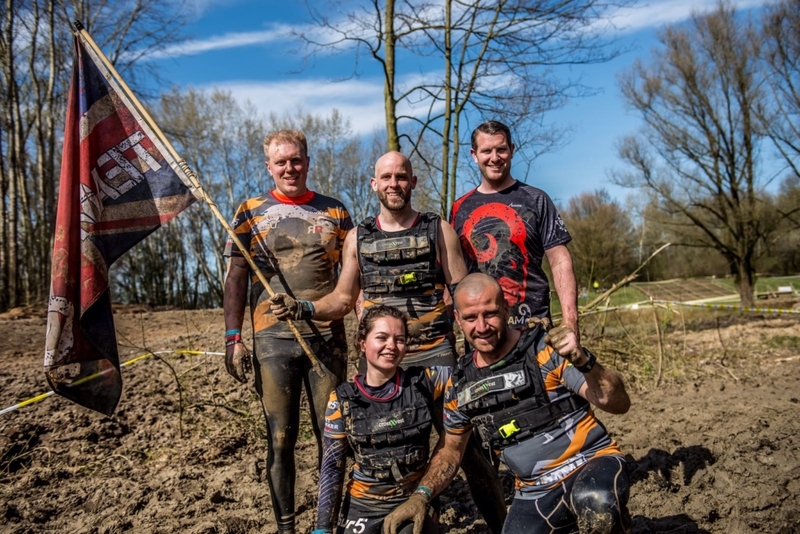 More OCR series runners. Shouted at by marshals about having one try to get up on the inverted wall. My teammate Kevin was shouting at me to show how it was done. Up, across the Dragonback, past the Wheels. Part 2, decided to skip the pegs. No way I was getting past that one anyways. ONE obstacle failed, still, a win! Monkeybarred my way towards the Snake Rings. Not going to skip that one again! Got cheered on by friends and teammate Franek. Pushed by MIT Ilja to ding the bell with my head. Did so, almost putting a dent in my forehead and moved on. The race series course also featured Flying Monkeybars. As a non-race runner I wasn't supposed to do them, but confident (and stubborn) as I was, I did them anyways. Dinged the bell and made my way towards the finish. The first few meters past the Flying Monkeybars I felt something dribbling over my fingers. I noticed I had two pretty severe rips on one of my hands, drawing some serious blood. No pain, so finish first, care later! Walhalla steps. More series runners trying to get up on the high bottom step. One hand in the air, to keep the blood from ending up on my clothes (because who wants to get dirty right?) I hesitated to get up. Looking at the tension on the faces of the series runners. Decided to give it a go, trying not to use the bloody hand. Launched myself up, got a grip with one elbow and the other hand and was on! Easily over the other steps. Made it towards the finish line of my third round! Quickly grabbed a shirt, a finish photo and off towards the medics for a bandage.